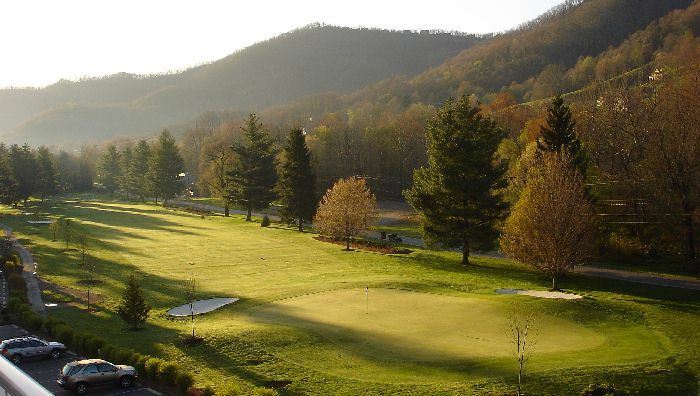 MAGGIE VALLEY, N.C. – A new era has dawned at Maggie Valley Club with the unveiling of a multi-million dollar clubhouse renovation. The project, which spanned two years, redesigned and rebuilt the clubhouse at a cost of $6 million. The goal was to create a crown jewel for the new Maggie Valley Club, a master-planned golf and residential community and resort. Heavy attention was paid to detail in every aspect of the 18,000-square-foot structure. From its rustic southern Appalachian exterior to its “casually elegant” interior, the clubhouse is wowing members and guests alike. The new clubhouse provides a wealth of amenities, such as: fine dining, casual dining, luxurious men’s and women’s locker rooms, fitness center, meeting rooms with state-of-the-art audio/visual components, high speed wireless Internet, balconies and decks overlooking the golf course, cozy gathering rooms with stone fireplaces, and an upscale, detached golf shop. A popular aspect for members, guests and the public is the return of food and beverage service. The Pin High Bar & Grille offers breakfast, lunch and dinner six days a week in a casual setting, while more upscale fare is available in the Renaissance dining room Thursday through Sunday. The reopened clubhouse has been warmly welcomed by members, as well as golfers staying in the club’s condominiums. They’re taking advantage of all dining options, as well as the big-screen plasma TVs, fitness center, and massage therapist service. Architectural services were provided by Foxhollow Goodson Architecture of Knoxville, Tenn., while Tutwiler Design of Montgomery, Ala., handled interior design. General contractor was Clark & Leatherwood of Waynesville, N.C.
Toohey is especially pleased with the interior. The goal there was to inject a sense of style, yet maintain a comfortable “homey” feel. For information on the new clubhouse or to inquire about dining, golf, condominium rentals or real estate options, call the new Maggie Valley Club at (800) 438-3861 or visit: www.maggievalleyclub.com.